In the backstory I gave in The Radical Beginning, Megalith City was destroyed in a cataclysm that dropped it into the canyon a long time after the events of this episode. The survivors, including Callista's descendants(s), then moved and founded what would eventually become Megakat City. 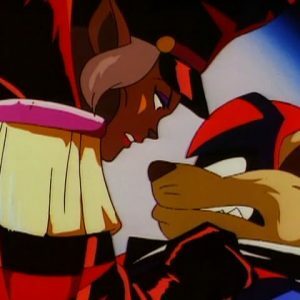 My own theory (which I mapped out in A Prophecy Reclaimed) is pretty much the same as NeeKnight's: the Pastmaster we see in this episode is the "present" one, who was released from the chest, fought the SWAT Kats in modern Megakat City, and then went back to the past to try and pick up where he originally left off. He didn't try to release his past self or otherwise meddle with anything prior to his imprisonment because, as he says, "disrupting the timestream is so unpredictable". I also agree with those who've said that Megalith City isn't located in the exact same place as Megakat City. Even with how the series sometimes plays fast and loose with locations, Megalith is inland and near canyons and cliffs, while Megakat is on the coast. It never came up in the fic, but my idea was that the port town Greenwater, which is two days' travel on foot from Megalith City, is the settlement that would later grow into the Megakat City we know and love. I can see events going that way as well, NeeKnight. It still explains how he knows the SWAT Kats and doesn’t undo anything. Time is still rewritten by the Pastmaster. And yeah, it is most likely that Pastmaster was sent already to the Dark Ages given that spell. I dunno why I was thinking he may have went back to prehistoric times, guess because the boys did. And yeah lol there are still timey wimey, Jeremy Bearimy stuff to sort out but these theories at least explain the bare bones of what happened. Who is the PastMaster? I know only of the Pastmaster. Obsessing over plot holes is what fans have done and will do until the end of time. But great point, Agracite. I did not even notice the castle was built on a cliff. Definitely could be very easy to lose the whole castle in one devastating swoop at some point in history. I continue to be amazed by SWAT Kats fans' ability to explain the series' plot holes. Once again, I realize that we take the show (or at least certain aspects of it) more seriously than the writers did. I always was confused by this storyline’s time frame. 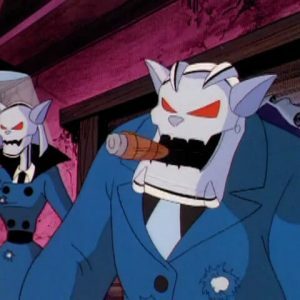 After the episode Pendragon from the series Gargoyles aired a few years later, a sort of Back to the Future Butterfly Effect time altered theory came to my mind. This combines both Bride of the Pastmaster and The Pastmaster Always Rings Twice episodes. Megalith existed where Megakat stands now. The Pastmaster succeeded in forcing Callista to marry him. He was able to do this as the SWAT Kats had not yet gone back in time to stop him. Some event could have caused the medieval city and all its occupants to have been destroyed. What event you ask? I’m guessing the marriage didn’t go well cause yeah hello, evil sorcerer guy forced this on a good hearted caring queen. I could see the Pastmaster growing frustrated and later outright angry over his Queen not loving him and the citizens hating him, possibly even leaving. Note that Megalith’s castle is on a cliff. Unable to deal with this any further, in a fit of rage Pastmaster destroys the cliff the castle is on, sending it down below, burying it along with its queen. The land there is more flattened and thus why there is no longer a castle. Any books or documents of its history lost to the ages in that rubble. Now there is still a conundrum from the first episode of the Pastmaster being imprisoned. This could have been the event that caused the Magic Council he spoke of to imprison him and bury him by his tower. After all, it survived and was a few miles from Megalith. Now we fast forward to modern day Megakat City. Callista may not be remembered through history enough to make a mark of importance to be included in standard school history books. The museum gets a call a few years before the Pastmaster is released. A book was found by arrested grave robbers. Or perhaps the museum was charged with exploring the historical site and they found the Tome. Or Dr. Sinian herself began the project and she found it. The museum obtains the Tome of Time. Move forward to the night Tom and Jack are doing their grave robbing and stumble on the Pastmaster and open up the crate freeing him. This sets off the events in both episodes. 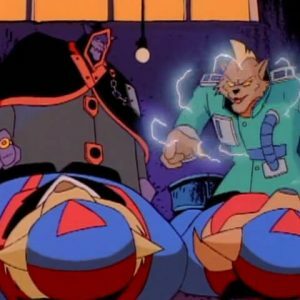 Pastmaster is defeated by the SWAT Kats and sent back in time in The Pastmaster Always Rings Twice. However, there is a change in Bride of the Pastmaster. 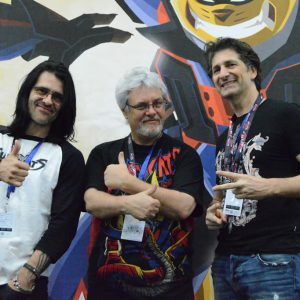 The change is somehow, the Pastmaster knows of the SWAT Kats. How is THAT possible? Through whatever events that took place on how he managed to get back to Megalith City during Queen Callista’s reign, to the Pastmaster’s future self, those events occurred in his own past. That is to say the Pastmaster had already experienced the SWAT Kats defeating him as he sets up his plans on getting Callista. Of course if he knows about his future, that would include being locked up by the Magic Council. Didn’t he plan for that? Maybe he did but you see, with the SWAT Kats being in the medieval time to stop him, they changed the way things happened. Instead of the Pastmaster succeeding in getting Callista to marry him, ruling Megalith, and so on, he failed. They left but then what? Was the Pastmaster destroyed? No given his further appearances in later episodes. 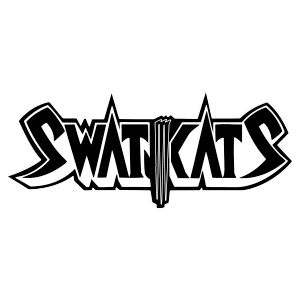 Perhaps the SWAT Kats only delayed the inevitable destruction of Megalith City. We never do get to see if there even is a Megalith Castle, but I think it would be noticed in the scenery somewhere. It could even be in the bottom of a canyon in Megakat Canyons, having crumbled and fallen due to weathering over time as the land became desert. In history books, it may be only seen as a legend like King Aurthur and Robin Hood, but based on the actual truth of it existing. Alternate timelines are possible. Could be that the Pastmaster somehow forced it into a timeline where it was forgotten? Or maybe Megalith was simply lost to the fog of history because it was destroyed around the time the Pastmaster was sealed away, weather and time erased most of the evidence proving the city existed at all. Most likely, Jake and Chance missed that lesson in history class. Jake was a gear head and Chance was a jock. What use was history to either one? I could agree that the alternate timeline is a possibility save for the fact that Callista looks like Callie. Either they are of the same bloodline or Callie is a reincarnation of Callista. Neither could happen if Megalith City slipped into a different timeline. Maybe the city could disappear, but Callista or members of her bloodline would have had to stay in this timeline for Callie to exist. Being "lost to the fog of history" is also a bit of a far stretch. Medieval time periods were only between the 5th and 15th century. We know about ancient civilizations and rulers centuries back into the BC era. There was a castle. Remains of castles tend to stick around for a long, long time. If nothing actively tried to get rid of the castle completely, the remains would probably still exist somewhere in the city. You could probably get a tour of it. No doubt Megalith City and its history would be common knowledge to everyone, including Chance and Jake. Even if not interested in history, they'd be visiting the castle on school field trips and probably covering it at least every other year in history class. Even if they did not retain much information on the time period, they should have at least known Megalith City existed at one point. I think we can agree that something happened to Megalith City to not only wipe it off the map, but to cut it out of history. Alternate timeline isn't out of the realm of possibility. It's also possible for Megalith to be wiped out sometime after Callista's reign. There is plenty of time between then and the modern day for something to happen. As you mentioned, Leon, great for fanfiction. Monsters as naturally occurring threats. I'd say that justifies the Enforcers more than ever if they're common threats. Great for fanfiction, too.